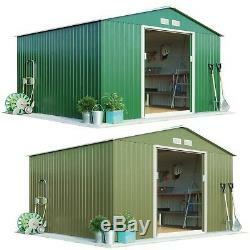 Garden Apex Roof Metal Shed 9.1'x8.4' Sliding Doors Outdoor Storage Waltons- New. Easy access; This shed comes with double sliding doors and a small ramp, ideal for accessing larger items such as lawnmowers. The double doors can be secured together simply with a padlock (not included) through the predrilled holes in the doors handles. Durable; Constructed from robust steel panels which are made to last. Low maintenance; There is no need for paints, stains or treatments. 10-Year Guarantee; This shed is supplied with a 10-year anti-perforation guarantee. The anti-perforation guarantee is subject to the condition that the product has been used in compliance with the maintenance instructions provided. Dimensions: Width 9&###x2019;1&###x201D; x Depth 8&###x2019;4&###x201D; x Height 6&###x2019;6&##xA0. Installation video; Please see our helpful installation video, to guide you step by step through the installation of your new garden shed. Keep your gardening tools, equipment and outdoor items protected and tidy with this Waltons Apex Metal Storage Shed. Made from high quality, low maintenance materials this shed is the ideal storage solution and provides a secure space to store away outdoor items. This shed features sliding double doors which provide easy access, great for manoeuvring larger items such as lawnmowers or tables. There is also a small ramp that makes wheeling items such as wheel borrows in and out hassle free. Made from high strength steel framing and panels, this metal storage unit will keep your items protected and secure with ease. The low maintenance materials do not require annual treatments or paints and will look great for many years to come. The apex style roof prevents rainwater collecting, protecting the building from weather damage and keeping items inside dry. Integrated air vents prevent the build-up of condensation, to help keep your items dry. This shed provides enough space for items such as bicycles, gardening equipment, tools and a work bench. We recommend that you build your shed on a solid level surface such as concrete or paving slabs. Ensure the surface is level and that the size of the surface is big enough to accommodate your shed. &###xA0; Please note: The courier will deliver to your front door only. Due to the weight and size of this product we recommend two people to lift and assemble. Assembly will take two people between 4-8 hours depending on the size of the shed. &###xA0; &###xA0; Please note: The entrance to shed is on the shorter side. Dimension: W277 x D255 x H202cm&##xA0. Due to courier limitations we are unable to deliver this product outside mainland UK, to Scottish Highlands, Isles or BFPO addresses. Here at Clifford James we have all you need to make your house a home. From home furnishings, bedding and laundry to security and DIY. Looking for&###xA0;garden gadgets&###xA0;and equipment? &###xA0;section of our shop. Our garden range&###xA0;includes power tools, planters and storage solutions. Many of our products are innovative solutions to everyday problems that often you can just not find anywhere else, whilst others are just great offers on must have items for you and your family. All deliveries require a signature. The item "Garden Apex Roof Metal Shed 9.1'x8.4' Sliding Doors Outdoor Storage Waltons- New" is in sale since Friday, February 16, 2018. This item is in the category "Garden & Patio\Garden Structures & Shade\Garden Sheds". The seller is "clifford-james-mail-order" and is located in Brecon. This item can be shipped to United Kingdom.